The Checkmate Chess Club in Springfield will not meet tomorrow, on New Year's Eve; as Barnes & Noble will be closing at 6 p.m. Please have a Happy New Year & join us on January 7th. A free, ten-minute tournament will be held at the Checkmate Chess Club in Springfield on January 21st & 28th. To join, just seek TD Ted Mann in the Barnes & Noble cafe from 7:30-8:15 p.m. on the 21st. Play will begin at 8:30 both nights. ... & 16 other games (10 annotated) from the 2006 KCCC. FYI : I won't be posting any games for the next 13-15 days. You should have enough to tide you over. :) I'll try to get a list of 2007 Kenilworth Championship participants & post that for you next Friday (January 5th). To save you the trouble of downloading multiple files from my archives & piecing them together, I've put all 89 games (75 annotated) posted since I started blogging into a convenient zipped PGN package. D34 Moldovan 0-1 Garcia : Kenilworth vs. Roselle 11/16/2006. The other best of 2006 games are contained in post #50. Here's is the Loose Ends Java-replay page & its zipped PGN file. The 2007 Kenilworth Club Championship starts on January 11th. If there are more than 10 total entries, we'll, like last year, have an Open section & an U1800 group. The Open section will be a round-robin with a maximum of 10 players (probably based on rating if more wish to play in the top group. The U1800 format may depend upon the number of entries in the section. If there are 7-10 U1800s, it will be a round-robin. However, for example, if there are just 4-6 U1800s, Tournament Director Geoff McAuliffe could run a double RR. If there are >10 players seeking the U1800 crown, a 9-round swiss would seemingly be required. To play in the event, you need to pay the $15 membership dues, a $25 entry fee & a $10 (refundable) commitment deposit (= $50 total). Registrations will likely be accepted until 8:30 p.m. on January 11 but I suggest that you join at our next meeting (Thursday, Jan. 4th) & state which section you prefer. For more information, contact Geoff or our Club President, Joe Demetrick. 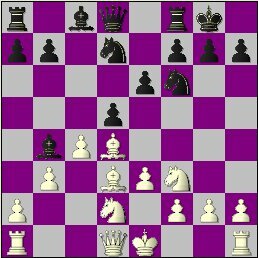 I'd like to do a "Best of 2006" post featuring 1 game by each Kenilworth Chess Club member. So, please bring a copy of your finest to our next meeting or e-mail it to chesscoroner@kenilworthchessclub.org . Game submissions by members of other NJ clubs are also welcome. Here's the usual Java-replay page & zipped PGN file. I'll upload some more games this weekend (Fri. Sat or Sun.) & make a couple end-of-year posts during Christmas week. I just wanted to remind all Kenilworth Chess Club members that the annual business meeting will be held tonight. It will start around 8:30 p.m. & probably last an hour. Visitors will be welcome after 9:30. The Minkov game has color-graphics. So, those with ChessBase, Fritz or one of their compatible programs, should skip the PGN & download this zipped .CBV file! Earlier this week, I defeated one of my Kenilworth Consultation teammates in an isolated d-pawn game. 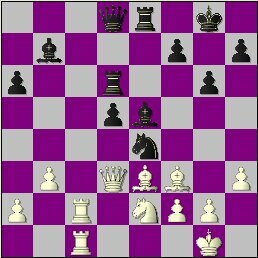 As in the aforementioned, the saddled side failed to push his isolonus at the opportune moment (17.d5!? below) and later lost. Here’s the Java-replay & zipped PGN for you. I’ve annotated & uploaded 3 additional games from Kenilworth’s matches against West Orange & Holmdel, including my losses to Bill Potts & Charles Hart. Here’s the Java-replay page & PGN file. If you’re wondering why there’s been a 13-day gap between posts, it’s mostly because I ruined the database with all of my games by accidentally deleting the .cbp player file & emptying the Recycle Bin before realizing the error. I knew all of my commentary was still there but it took parts of 4 days & everything but the kitchen sink (file-merging, doubles-sorting, cutting, pasting, typing, trial & error) to sufficiently incorporate it into a new DB. Some symbols in the scores were turned into text but that can be remedied. I've uploaded my notes to the Kenilworth-Roselle Java-replay page & PGN file. Due to a transcribing error, moves 42-45 of Camejo - Minkov & the corresponding comments may be incorrect. I'll re-check the score with my source & make any necessary changes late tonight. 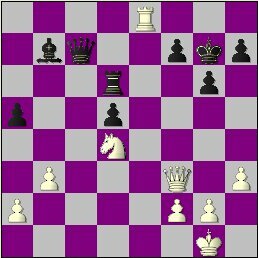 The Kenilworth Chess Club closed out their 2006 match schedule with a 7½-2½ loss at Roselle last night. Ari Minkov was the visitors’ lone victor. FM Steve Stoyko, NM Scott Massey and Joe Demetrick had draws. Roselle, which won last year’s inter-club tilt by an even more lopsided 8½-1½ count, did most of their damage on the bottom 6 boards, scoring 5½-½. Here’s a Java-replay page & a zipped PGN file with 3 of the games. I’ll add notes sometime in the next few days. Below is a list of local (mostly Union County) chess clubs. Saturdays 8:30 - 11:00 p.m. Tournaments are run 3 days a week. Lessons given 2 Sundays per month. Thursdays 10 a.m. - 5:00 p.m.
Matches played once per month. Thursdays 7:00 p.m. - 10:00 p.m.
Mondays 10:00 a.m. - 4:00 p.m.
Sundays 1:30 p.m. - 8:00 p.m. Almost exclusively a tournament site. Post updated 4/12/2013 @ 9:40 p.m.
Maraj Daftani (2164) won the 5-minute tournament at Springfield last night, with a 6½-½ score. Bob Sherry (1812) was a point back at 5½-1½ and Freeman Jackson (2028) was 3rd with 5-2. Here’s the event crosstable. I've uploaded my notes to the Kenilworth consultation game. Hope you like them. Here's the Java-replay page & the PGN file. Sorry for the delay. Annotations & java-replay will follow sometime tonight. 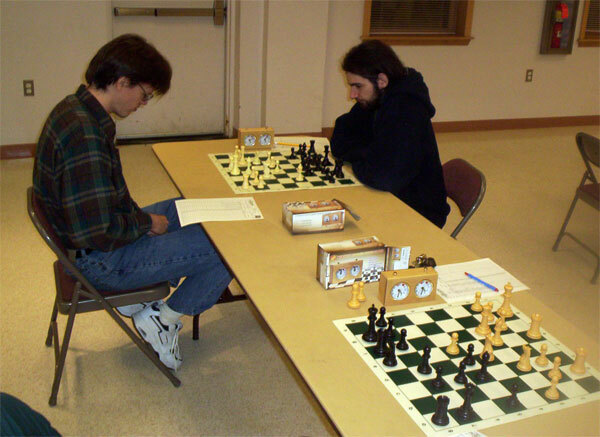 There will be a 5-minute tournament at Springfield’s Checkmate Chess Club on Sunday the 12th. Details here. One of the chess players forgot his coat at the Kenilworth Community Center last night. It was put in the club’s locker for safe-keeping and may be claimed next week. A 10-board match between the Kenilworth & Roselle chess clubs will take place at Roselle on Thursday the 16th. If you’re a Kenilworth member & would like to take part, contact Joe Demetrick. The consultation game between teams headed by NM Scott Massey (White) & FM Steve Stoyko (Black) had to be adjourned after 25 moves as the generous 5 minute per turn time limit prevented us from completing the contest in a single session. The fun will resume next Thursday night. Adjourned. 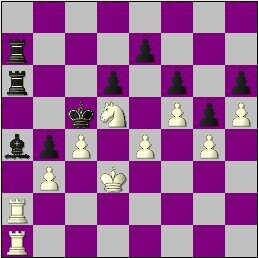 Black sealed his 25th move. Tonight at the Kenilworth Chess Club, two lecturers (in seperate rooms) will play a game & provide commentary to their respective audiences as they go along. The orators, as of this writing, have not been announced but I invite all the players in the area to attend. I played in a consultation game on FICS (PGN) last year & enjoyed exchanging ideas with the other participants. The club opens at 8 p.m. & the event will probably start at 8:15 or 8:30. New Jersey Master Victor Shen (2066 FIDE) tied for 23rd place in the Boys U14 section of the 2006 World Youth Chess Championships. None of his games, however, are among the 490 in the Monroi database & TWIC #625. Hopefully, his teacher, NM Scott Massey, will supply 1 or 2. Due to the large number of recent events, I’ve been making more posts than originally intended. In November & December, I will likely make just 1 post per week. Scott Massey will be giving a lecture on Estonian GM Paul Keres tonight, starting at 8:15 or so. A $5.00 fee will be charged. 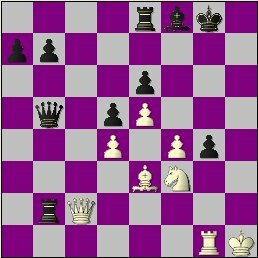 Last week at Kenilworth, I played a training game against Laukik Gadgil, who asked me to analyze & post it for him. Here’s the replay & PGN. The Java-replay page & PGN file for this event have been updated. Ari Minkov successfully defended his 2005 Kenilworth G/30 title, with a win over Ted Mann & a 4th-round bye. Here’s the event’s final crosstable, Java-replay page and a PGN file with all 10 games (7 annotated. I'll update in a few days when I finish my notes to all of last night's games. Vladimir Kramnik has won the tie-breaking rapid match over Veselin Topalov 2.5-1.5 & is now the undisputed World Chess Champion. The 1st game was drawn. Kramnik won the 2nd, Topalov stayed alive with a win in the 3rd but lost game 4. All of the rapid contests featured Slav or Semi-Slav variations. Tonight's meeting of the Kenilworth Chess Club was cancelled because the back room/playing area was unavailable. Rounds 3 & 4 of the G/30 tournament will be next Thursday night, 10/19. If you have any questions, contact Club President Joe Demetrick. Vladimir Kramnik & Veselin Topalov played to a draw in game 12 of their World Championship match. There will be a rapid match tomorrow, to break the current 6-6 tie & determine a winner. For annotations go to The Week in Chess, Zsuzsa Polgar's blog & Chess in St. Petersburg. ChessBase has a replay but no notes as yet. Here are all the games thus far, in Java-replay & a zipped .cbv file plus a crosstable. The event concludes next Sunday. All the round 1 & 2 games have been annotated & uploaded. Here’s the updated Java-replay page and the amended PGN file. Ari Minkov & Ted Mann (2-0) are tied for 1st after 2 rounds of the Kenilworth G/30 swiss. Ed Selling & Pat Mazzillo share 3rd (1-1). There are but 6 players in the event, compared to the 11 that took part in last year's G/30. Minkov, the defending champion, escaped a bad opening in the 1st contest & a lost position in his 2nd. Just 1 of the 6 games played lasted more than 26 moves. You can play thru all of them online or download a PGN file with them. I've annotated 1 game thus far & will upload notes to the others as soon as possible. Unfortunately, Wednesday night's storm knocked my phone line out & it won't be fixed until Sunday afternoon. I had to submit this report from a local library. Unlike the first week, there were no upsets in the Springfield Handicap last night. 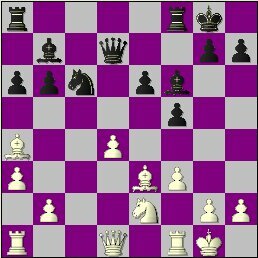 Bob Sherry won his game, despite spotting 4 moves, & I capitalized on my foe’s faulty sac to take the lead at the event’s halfway mark. Here’s a Java replay page & a zipped .cbv file with all the contests. #13 Demo Boards in Bathrooms Causing WC Crisis!? Veselin Topalov & his camp apparently protested Vladimir Kramnik's numerous bathroom visits over concern the latter was using the demonstration board that match organizers placed in his (& Topalov's) facility. Registration : On 10/5, from 8:00 to 8:30 p.m. I expect the Kenilworth club will open at 7 p.m. those nights, as it did last year. The WOCC club meets on Tuesdays, from 7 p.m to midnight. I have added Kernighan-Bartell & Jim Cole’s win to the Holmdel Java replay page & PGN file. Thanks to Mike Goeller for sending the above photo. The Java replays & PGN with Thursday’s games against West Orange have been uploaded. The Kenilworth CC, playing without 3 of their top 4 players (FM Steve Stoyko, NM Scott Massey, Michael Goeller), took a whooping at the hands of visiting West Orange last night, 7.5-2.5. NM Peter Radomskyj scored the decisive point. Glen Hart & Joe Demetrick notched wins for the home squad. Ari Minkov managed a draw. Kenilworth had won the previous meeting (at West Orange, on 6/22) by a 6.5-3-5 count. 3 games from this event & 2 more from last week’s Holmdel match will be posted in the next few days. The Springfield Handicap got underway on a surprising note last night as Ted Mann & Bert Shiffman upset the 2 top seeds. 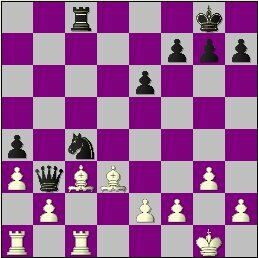 I overcame my opponent’s 3-move advantage & won a nice game. Here’s a Java replay page & a zipped .cbv file* with all the contests. 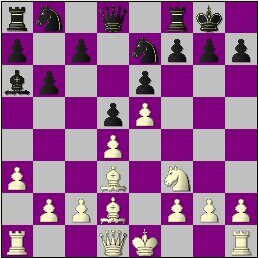 * This is a compressed ChessBase archive. To read it, you’ll need a ChessBase product, such as ChessBase Light, which you can download for free. Games 1 & 2 in Java replay & PGN. Game 3 is Tuesday. You can watch it on FICS or U.S. Chess Live, among other places. #6 Bartell brillancy in D.C.
Before the start of last night’s match, folks at the Holmdel CC raved about Tom Bartell’s Atlantic Open win against Larry Kaufman but they didn’t have the full score. Luckily, I found it in a recent The Week In Chess issue (#617). Here’s the Java replay & PGN for you. The Kenilworth CC scored a surprising win at Holmdel last night, thanks to a 5-0 sweep by Greg Tomkovich, Mike Wojcio, Joe Demetrick, Joe Renna & Jim Cole on boards 6-10. Michael Goeller’s draw against Vladimir Lipman brought the score to 5.5-3.5 & secured the victory. Holmdel won the first meeting, in Kenilworth, on April 22nd, by a wide margin but, on this occasion, they were without FIDE Master Anatoly Volovich & expert Steve Anderson. I have annotated Goeller’s clinching contest & my loss to Brian Katz. You can replay those games online or download the PGN. I’d like to present more games from this event (including Kernighan vs. Bartell) but, to do so, I need your scores. Please e-mail them to me. Java-replays for the deciding games & a zipped PGN file with 33 games (21 annotated) are up. Here’s a symbol key, if you need it. - Greg Tomkovich struggled in rounds 1-5, losing twice & nearly dropping 2 other games. But he went undefeated (7-0-2) the rest of the way, upsetting NM Kernighan in week 7 to grab a share of the lead and beating me in last round, to claim clear first. Greg followed his KST triumph with a 3.5-1.5 score at the NJ Open. - Mark Kernighan The 2005 KST champ, got off to 5-0 start but hit a big bump in weeks 6-11, where he failed to win a single game (0-1-3). Mark skipped rounds 9 & 11 to play 5-minute games against non-competing players and, in the end, this affected his final standing. - Devin Camenares dropped 2 of his first 3 games but lost just once in the last 10 rounds (7-1-2) and proved to be an under-rated unrated! - Ari Minkov had a excellent event despite an extended vacation (7 weeks!). He suffered but 1 defeat in 9 games (4-1-4) and nicked Kernighan for a pair of draws. - Joe Demetrick continued his run of successful Kenilworth results by finishing with a +2 mark. - Richard Lewis didn’t join until round 6 and was under the radar for most of the tourney but he won 3 late games and vaulted to 5.5-0.5. - Ed Selling was undefeated thru the first 10 weeks (4-0-2) and had a good showing overall (+2). However, losses to the co-runner-ups nudged him out of the top 5. - Anna Matlin finished at 1.5-3.5 but impressed everyone. She could have been +1 if not for time pressure stumbles against Goeller & Camenares. Anna gathered additional notice by drawing NM Peter Radomskyj at the 8/20 Westfield Swiss. - I played poorly & deserved a lower placing. Only my event-high 17 games kept me in the mix. P.S. - For more on the 2006 KST, visit The Kenilworthian archives. ... plus a Crosstable of the event. 2 prize-deciding games from the last (14th) round and an overview will follow within a few days. Hi Chess Fans. 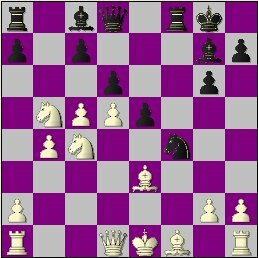 I’m John Moldovan, a correspondence-chess expert (USCF 2120) and contributor to the Checkmate Chess Club site. As noted above, my blog will primarily feature annotated games but reports on local events & clubs will appear from time to time. Thanks to Michael Goeller, author of The Kenilworthian & the Kenilworth Chess Club webmaster, for his encouragement and this opportunity. P.S. 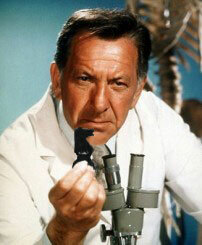 - I hope NBC, Universal, Glen A. Larson Productions and Jack Klugman don’t sue for copyright infringement!